Cedar fencing is a good choice because of its sturdiness, and cedar wood contains oils that resist rot and repel insects. 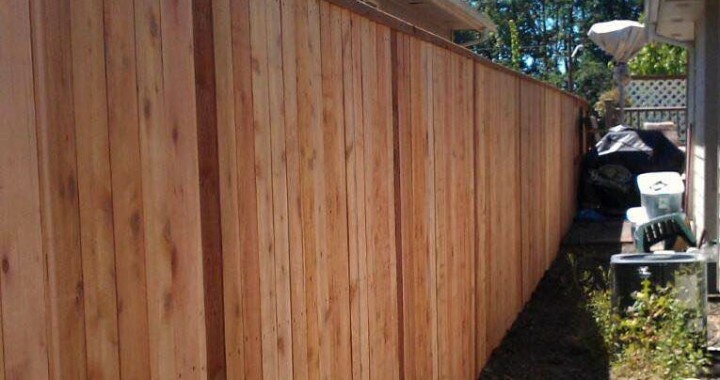 * Standard Build: your average fence with the option of flat top or dog-eared fence boards. * Standard Build with a top cap: similar to a standard build but has a 2×4 top cap giving a picture frame look to the fence. This application uses flat top fence boards. * Custom Build: usually involves more details such as a 1×4 around the top and bottom or lattice on the top. A cedar privacy fence is a good option for total privacy in your backyard entertaining area and to keep in pets. It also keeps out pests. Gates vary in size and shape. In terms of shape, they can be flat or half-moon. The hardware can be black or galvanized metal.